Miami Hurricanes quarterback Brad Kaaya lost a tooth. Some Miami fans showered the field with debris late in the fourth quarter. A kick decided the game. Another game between the Florida State Seminoles and the Miami Hurricanes. 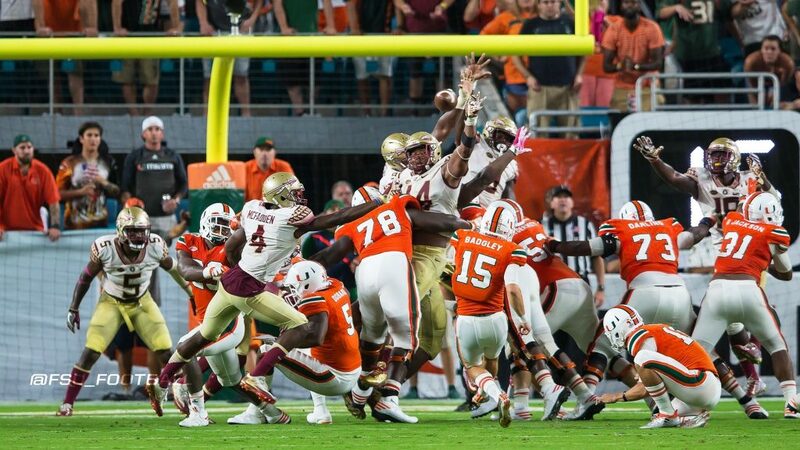 DeMarcus Walker etched his name in this famous in-state rivalry blocking Miami kicker Michael Badgley’s point-after attempt with 1:38 remaining in the game. That was the difference as the No. 23 Seminoles escaped with a 20-19 victory over the 10th-ranked Hurricanes. This win keeps the wheels from falling off the Seminoles season. Walker is a Jacksonville, Florida native, which was hit by Hurricane Matthew. Jacksonville was met by strong winds and flooding resulting in power outages. Walker mentioned his hometown was on his mind as he lined up for that crucial point-after play. Seminoles running back Dalvin Cook, for the third straight year, filled up the stat sheet against the Hurricanes. Cook finished with 150 yards rushing and had a wide open 59-yard scoring catch to spark the Seminoles’ second-half 20-0 run. The Hurricanes ended the run late in the fourth when Kaaya connected with Stacy Coley on an 11-yard touchdown pass. But the 6-foot-3 Walker pushed through some blockers and got his arm outstretched just enough to knock away what would have been the tying point from Badgley. The only score in the second half for Miami, needed the extra point. “It’s a heartbreaker,” Kaaya said. Kaaya lost a molar in the third quarter when he took a helmet-to-helmet hit from Florida State’s Matthew Thomas, who was ejected for targeting, the second straight year a Seminoles player was tossed for targeting the Miami quarterback. Meanwhile in the fourth quarter, Miami’s Jamal Carter was thrown out for a targeting hit against Kermit Whitfield who also had a touchdown in the game. Some Miami fans showered the field with debris at that point. The second-longest active streak of AP Top 25 poll appearances will live on — since Florida State surely will hold a spot for the 76th straight week after this comeback win. Hurricanes leads the series 31-30. The Seminoles host Wake Forest on Oct. 15, looking for their fifth straight win in that series. Score of the last four matchups: 178-22, though last year was 24-16. The next two games will likely decide Miami’s fate in the ACC Coastal race. North Carolina visits the Hurricanes on Oct. 15, five days before Miami goes to Virginia Tech.